Our play-it safe date for getting in stock items to you by Christmas by UPS Ground is Thursday December 17th. For International orders, Friday the 11th is the last day for USPS EMS for in stock items. If we don't have it in stock? As always, we'll communicate when you can expect it and what your options are. Make sure to check out our KTMtwins 2009 Holiday Sale. We're up on our new Google Voice number (415)YO-TWINS / (415)968-9467, and it is rock solid Click to Call app. If you're on a land line or up on Gizmo, it is free from our site. Click on the Call Me link on our site, enter the number of the phone you wish to talk on, and Google calls you and connect us. Yowza! Just in time for your Christmas list to Santa. We are proud to announce the addition of the KTM 950 / 990 Adventure GPR 2 into 1 Full Exhaust System. Weight reduction (19 pounds on our scale!) and styling are just the start of what this full exhaust system will do for you. The kit includes a quiet core insert and spark arrestor screen so you don't have to worry about the rangers when riding offroad. El Jefe ran this system hard down in Mexico with great results. We are even throwing in the Carbon Protection that mounts to your stock skid plate, and protects the header pipe from road debris and rock damage. At just over what a slip-on Akrapovic system runs you can't go wrong. Available while supplies last so make sure and tell Santa to kick it in high gear. 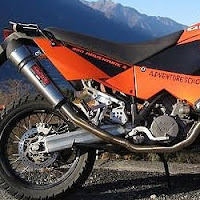 Looking to really push the ponies up on your carburated KTM LC8? This is the kit for you. Unleash the beast within by installing the KTM 950 Adventure and 950 Super Enduro Keihin Flat Slide Carburetor Kit . Keihin has been the choice of professionals for years and the FCRs are the most sought after carburetors when building up a race engine. You get all of the necessary hardware and a new set of throttle cables so installation is simple and efficient. Jetted perfectly for anyone at sea level, but don't worry if you aren't, they include a tech sheet letting you know the proper changes to make them run perfectly at any altitude. You get a choice of the 39mm carbs or you can supersize your meal by going with the 41mm big boys - the choice for most LC8 engine builders. Keep Santa busy this season and request the carb kit and a GPR system! This KTM 690 Oil Filter and Seal Kit is essential to all 690 customers when doing your oil change because it gives you all of the necessary filters and screens to get the job done and do it right. Pick one up next time you are ordering oil you won't regret it. We have been working on the KTMwins 2009 LC8 Water Pump Upgrade Kit for a little while now and it is finally ready. We bought out all of KTM USA's stock on the individual parts and made them put in another order with Austria. We caught them off guard with the demand of this system. If you are running the stock Water Pump on your machine you could benefit with the additional flow and redesigned water pump impeller in this kit. The impeller has better flow and the cover(with all of the necessary hardware) gives you additional volume. Next time you are ready to do your water pump pick up the upgrade kit. You only have to do it once! "After upgrading your water pump kit to the new version don't forget to choose our 2009 version of our water pump rebuild kit". 1. After draining the coolant for maintenance or replacing the water pump kit. Fill the coolant in the radiator as normal. 2. Here is the trick! Get the front wheel in the air approximately 18 inches. At home the trick is to put the bike on the center stand with the stand feet on a curb with the rear wheel in the street. Push down on the rear to get the front wheel up in the air. 3. Run the bike with the radiator cap off. The coolant will "burp" a few times while warming up ( 3 to 4 minutes ). Top off the coolant from there. 4. Install the radiator cap "check the rubber on the cap for damage or dirt and debris". 5. Set the level of coolant in the reservoir and your good to go. 6. Now get out there and live the adventure! Our friend and customer Mark Bothe has decided to sell his beautiful and well-sorted RC8. From Mark: " Mileage is 1,251 miles. First service was completed at 600 miles. All KTM factory recalls have been performed by KTM of Gresham. The SuperCorsa Pros were removed at the 600 mile and Pirelli Corsa IIIs were placed. This bike is very unique. It is one of less than 50 model year 2009 in the US. Also, unique is that this is the only bike in the US with custom GP Suspension 25mm Superbike Cartridge forks. Special fork caps and compression needles. The suspension is set for a 175-185lb rider. The bike comes with the original WP fork guts, original shock spring, levers, exhaust, sprocket and SuperCorsa tires. This bike also comes with the KTM Briefcase, 2 sets of keys and the orange key. This bike has the factory Akrapovic map installed. I have installed a Cox Racing Group radiator guard and axle and case sliders. I did scrape the right foot peg, so there is a scuff on the underside of the peg. Everything is immaculate on this one of a kind machine. I have never been talked to by so many strangers than when I ride this bike. $14,900 USD/obo". Seems like a steal! If you are interested in talking to Mark, contact us and we'll forward your contact information to him. If you have a well loved machine that you would like to see in our newsletter to please send those photos to us and maybe your bike will be the next featured ride. Good luck on your next project, Mark. Did you know that as a member of ADVRider you get 10% off orders of $999.00 or more? Simply leave your ADVRider username in the comments section when checking out and we will adjust the total for your discount. It's as easy as that. That's all for now. Ride Safe. See you on our next Adventure. Got an idea for a product or Tech Tip? Send it to us here.